Love That Max : Special Needs Blogger Weekend Link-Up: Posts galore! 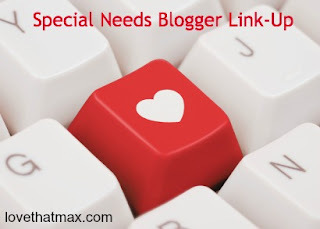 Special Needs Blogger Weekend Link-Up: Posts galore! It's another Special Needs Blogger Weekend Link-Up, a post extravaganza the likes of which mankind has never seen. Or something like that. Like this: Love That Max: Is It Friday Yet? Um, Ellen, I think you goofed this week. I don't see any way to add a link. I'm so glad it wasn't just me! Um, I was just testing you guys to see if you really were paying attention. Yeah. That's it. Also: oopsie. It's up now! I just posted about my daughter for the first time, who is typically developing and has an older brother with special needs. I included a personal letter I wrote to her when she was 2 years old. Thank you for allowing us to share! Yay for Friday Link-up! This week, I wrote about my dirty little secret regarding sleeping in on school days.